Either at a great symphony hall or at a joyous holiday music program, some of us have been fortunate in our lives to hear an otherworldly choral performance, one that sounds like a morning lark singing "hymns at heaven's gate" as Shakespeare once wrote. Boychoir, a new feel-good, but very real and inspirational drama that screens at the Windsor International Film Festival (November 1-9), serves up both music and a story that is, well, transcendental. Helmed by Francois Girard, Boychoir is a story about a troubled and orphaned young lad struggling against the odds to find his voice, both literally and figuratively. Girard, who previously directed The Red Violin which won an Oscar for Best Original Score, says of the power of music in film, "I defy you to find a filmmaker who says he doesn't like music. Among the weapons of a filmmaker, music is maybe the most powerful." 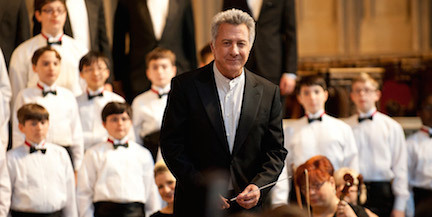 Co-starring Kathy Bates, Debra Winger and Eddie Izzard, Boychoir's anchor is Dustin Hoffman who plays a disciplinarian and sometimes cold choirmaster, who nevertheless has a judicious eye for unearthing talent for his school's choral group. Boychoir is also a meditation on the impermanence of of the transitory human gifts some of us are given -- indeed, the light that burns twice as bright burns half as long. The film, which has worldwide distribution set up and is close to acquiring U.S. distribution for 2015, was inspired by a news clipping sent 17 years ago to Boychoir's screenwriter Ben Ripley, about a day in the life of real members of the Princeton, New Jersey-based American Boychoir boarding school. I was struck by the fact they're essentially professional singers, who train rigorously and travel the world, yet are 10-12 years old. I thought it an interesting juxtaposition to put a professional musician into the body of a troubled boy entering both the rise and the sunset of his ability. The changing of his voice with the onset of puberty means the end of his gift, and there's this tremendous loss that you feel, having worked so hard to master a certain sound and then knowing you will lose it. And isn't it always the most beautiful right before you lose it? Such an artistic career is over in a remarkably short period, sometimes under two years. As written by Ripley, the movie has a building "accretion of moments" that sneak up on the viewer, and by the middle turning point, it has utterly grabbed us. 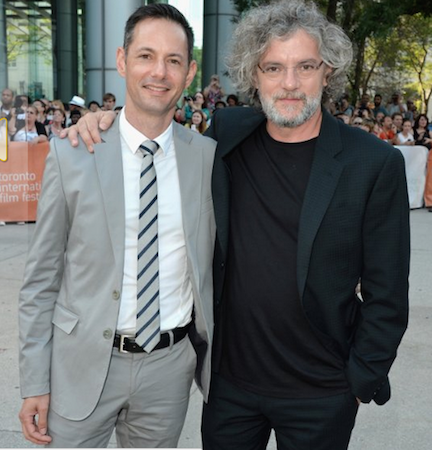 At Boychoir's recent premiere at the world renowned Toronto International Film Festival, over 2500 people rose as one in a standing ovation at its conclusion. The very effective elixir of music and story had worked its magic. Stet, the troubled lead young character, is "wonderfully played" by actor Garrett Wareing, who was mostly surrounded by real members of the American Boychoir on set. Hoffman, who describes young Wareing as splendid kid who "has a rich soul and a sense of the truth," has a complicated paternal relationship with Wareing's Stet. The music is beautiful, it was worked on to perfection and it just gleams like a gem. There are half a dozen achingly evocative pieces, both traditional and contemporary, from the American Boychoir's repertoire. A lot of care was put into the recordings, and we were fortunate to have a director, Francois, who's made several movies about music, including The Red Violin and Thirty Two Short Films About Glenn Gould. But while the music is key, it's also a character and relationship story, about fathers and sons, mentors and prodigies. Yes, the music and story is very uplifting. But to have revelation and growth you need sadness and failure, and that's equally part of it. We tend to write off 'uplifting' as something that's sentimental, but setbacks and heartache are prerequisites to all that. And this movie goes fully through that arc. I feel it has the potential to be a breakout movie and appeal to people who wouldn't ordinarily go to a boychoir concert. And, just as this character, Stet, is from a small town in Texas, I would love people in any small town in Texas to see and hear this movie. My hope is that as many people as possible see it because it's a type of music that a lot may not know about. It's not stodgy or old liturgical dirges. It's alive, vibrant, contemporary and absolutely gorgeous.